Rapid prototyping, or 3D printing, has already moved from science fiction to everyday fact. This type of production generally involves a machine laying down layer after layer of material until the 3D form is complete. 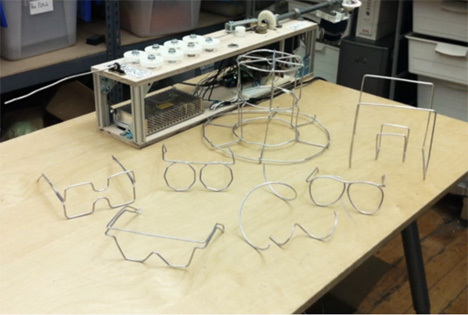 The DIWire is a machine that can quickly produce 2D or 3D objects out of simple metal wire. The wire is first fed from a spool through wheels that straighten it out. It then passes through the bending head which moves around to create the desired shape. The machine takes orders in the form of vector files or text files. It’s a neat concept, but doesn’t seem to have many practical purposes to consumers or industries – except perhaps for making novelty sunglasses frames.